Picasso, Cary Grant, James Dean – these prominent men may or may not have known their port from their starboard, but they definitely knew a thing or two about the power of nautical style. Less a trend (as it’s often dubbed by the fashion media), more a summertime perennial, the nautical aesthetic has endured by virtue of its sheer simplicity. Which, funnily enough, is also what sometimes makes it so difficult to get right – tread a little too far into the water and a look that started out as refined rapidly plunges into the cringe-inducing depths of fancy dress. “It’s so important not to be too literal with this look,” warns Tony Cook, menswear editor at online luxury retailer FarFetch. “Nautical stripes are more than fine, but matching with chinos, boat shoes, a flat cap and anything with anchors will leave you looking like you’re in costume.” A little goes a long way, then. If this is your maiden voyage with nautical, remember that while the below pieces are all important in their own way, don’t go overboard by piling every single one on together. Anchors away. An indisputable classic – nothing is more integral to a nautical look than the timeless Breton T-shirt. A short-sleeved style will allow your skin to breathe but a long-sleeved version offers you a little more mileage, lending itself well to both casual and smart-casual getups, year-round. While the Breton top’s traditional fabrication of wool and cotton was a good fit for fishermen who spent hours toiling at sea, 100 per cent cotton will do fine for your cruise or weekend getaway. As for the stripes, we suggest sticking with the traditional navy and white palette. Key Brands: Saint James, Sandro, A.P.C., Saint Laurent, Ralph Lauren, Ami, J.Crew, Gucci, ASOS, Reiss. First sported by Cambridge rowers in the first half of the 19th century, this trusty piece of tailoring has stood the test of time, looking every bit as sharp now as it did back then. Easy to button up over a Breton top or just as good thrown over a simple white T-shirt, a double-breasted white, off-white or navy blazer (preferably with gold buttons) will lift your summer looks from unremarkably casual to carefully put-together. Given you’ll be wearing this as a second layer, take some sweat-prevention measures and find a style that’s made from 100 per cent cotton or a cotton-linen blend, rather than a comparatively heavy wool version. 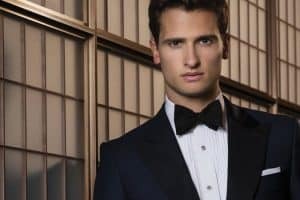 Key Brands: Suitsupply, Reiss, Tommy Hilfiger, Mango Man, Jaeger, Canali, Boglioli, River Island, Burberry, Banana Republic. Although technically a soldier’s staple gone civilian (first invented for British and French military uniforms), chinos are now just as connotative of seamen’s style as stripes. And it’s all in how you wear them. Whether or not you generally make a point of ‘mankle’-baring during the warmer weather, going sockless and rolling your trouser hems is a necessity for nailing nautical style. Look for a moderately slim fit; not so skinny as to look like you’re auditioning for a boy band to rival McBusted, but not so baggily cut as to undo any effort you put in entirely. Colours-wise, stick to the traditional nautical palette of red, white and blue, while bearing in mind other pieces you plan to wear them with. Key Brands: J.Crew, Ralph Lauren, John Lewis, Tommy Hilfiger, ASOS, Reiss, Mango Man, Uniqlo, Incotex, Club Monaco. Invented by Paul A. Sperry in 1935, boat shoes may originally have been devised for traversing a slippery deck, but today they serve just as well as the anchor to your fair-weather looks. Both leather and canvas styles have their virtues; the former being a little more polished in its appearance, the latter often offering unbeatable comfort and breathability – so, opt for the style that suits your requirements best. Keep in mind the pieces you’ll be teaming your boat shoes with before committing to a particular colourway. Navy might be an obvious choice given the theme here, but they’re only really wearable with white, red or off-white chinos, so tan or chestnut brown might be a better bet. And we know it’s the done thing to wear these sockless in the truest sense of the word, but slipping on a pair of invisible socks will save your feet as well as your shoes – not to mention contain smells. Key Brands: Sperry, Timberland, Lacoste, River Island, ASOS, Quoddy, Tommy Hilfiger, Mango Man, ALDO. If you’re a bit of detail obsessive, swapping your usual accessories for styles a little more maritime adds the perfect, not to mention subtle, finishing touch. Choose from woven leather or canvas belts worn around chinos or shorts, leather or rope bracelets to complete casual takes on nautical, or anchor tie clips and cufflinks for something a little more tongue in cheek. As much as a Breton top is a universal classic, it’s worth taking some time to ensure your stripes are suited to your body shape before buying. “Do wear a T-shirt or sweater with stripes at the chest and shoulder area if you want to make yourself look broader,” says Gilfillan. 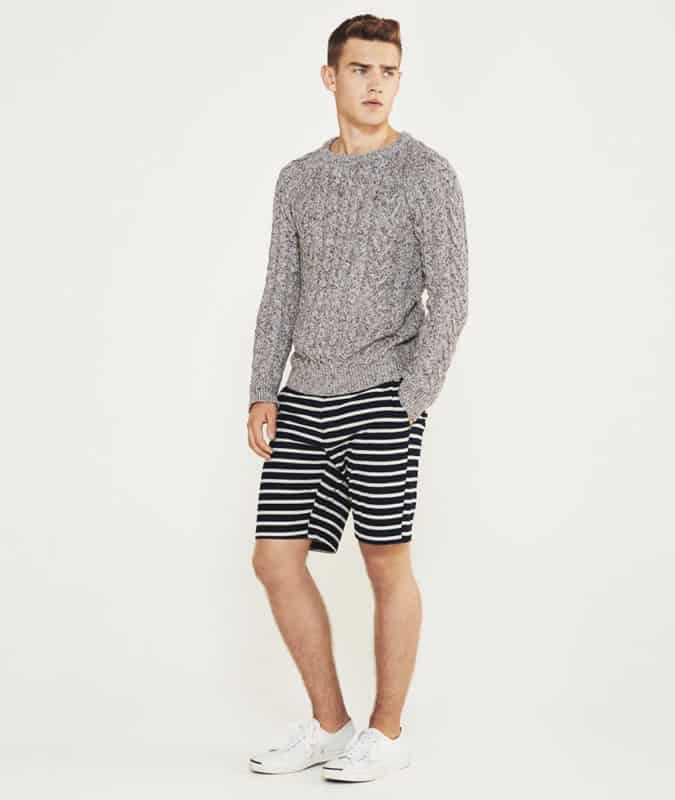 If your frame is on the slimmer side, your torso can take all kinds of stripe. But we’d suggest you hang back if you’re built like a battlecruiser. Men with broader shoulders and more muscular body types should look to finer horizontal stripes to slim down, rather than emphasise, their above average size. 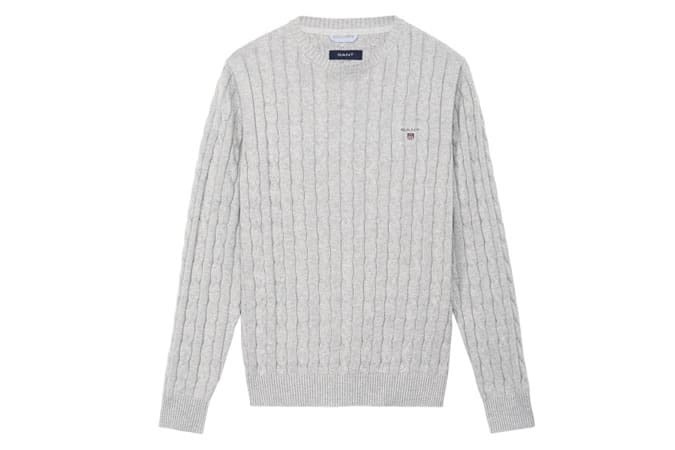 A firm favourite of fisherman for years, the heavy-gauge cable knit jumper is another enduring nautical piece – but in summer they’re only good as sweat rags if you don’t opt for the right type. Swerve traditional heavy gauge wool versions and instead opt for 100 per cent cotton or cotton-linen blend designs that are both breathable and lightweight – ideal for throwing on over your Breton tee when the temperature drops in the evening. Still, a lightweight knit isn’t much use in the rain. So if you’re looking to cover up from a heavy summer shower, throw on a fisherman’s jacket instead. Lightweight and waterproof, one of these seafaring staples will keep you dry and see that the nautical theme stays intact – worth considering if your summer’s more Rotherham than Riviera. Nautical needn’t always mean Breton stripes and heaps of blue. Try a subtler approach by incorporating marine-inspired details like – as Gilfillan suggests – anchor motifs, brass or contrasting white buttons, epaulettes, rope and toggle fastenings, and boat necklines. Masculine and perfectly suited to most, nautical style is one way of dressing we suggest you get down pat sooner rather than later – hopefully now you feel slightly less at sea. What way do you wear nautical? Are there any tips or go-to brands you’d like to share?